Richard was born in Nairobi Kenya but spent his childhood life between Kenya and Uganda. He developed a deep rooted passion for domestic animals and from an early age he volunteered with the Uganda Society for the Protection and Care of Animals USPCA. He completed his Bachelor of Veterinary Medicine in 1999 and became the first qualified vet for the USPCA. Here he developed all the programs, with the support of International Fund for Animal Welfare, a community education Centre was built and established relationship with some government departments. Through the USPCA work he was exposed to wildlife and cases of animal cruelty around wildlife sanctuaries. A placement at Baltimore zoo, USA allowed him to develop his skills and work with a number of unusual animals, including fixing a polar bear’s humeral fracture. He also worked at the eagle Centre in Baltimore, the Baltimore Aquarium and several other veterinary research at Johns Hopkins University. When the Chimpanzee Sanctuary & Wildlife Conservation Trust CSWCT came calling, it provided him an opportunity to care for and specialize in wildlife in a country closer to his own heart. While at CSWCT, he was introduced and oriented to wildlife medicine by celebrated professional, Dr Wayne Boardman. He was involved in primates and anesthesia, worked in Queen Elizabeth on Buffaloes, were involved in the transfer of rhinos from Kenya to Uganda. While at the sanctuary, he was involved in several wild chimpanzee interventions including the first successful wild chimpanzee anesthesia in Kibaale National Park. Treated Mountain Gorillas for scabies in Bwindi Impenetrable forest and memorably treated Faustino, one of the surviving sons of Jane Goodall’s research groups’chimps, the alpha male chimpanzee in Gombe national park in Tanzania. He was also involved in founding the Veterinary Group of the Pan African Sanctuaries’Alliance and contributed to two chapters of the PASA Veterinary Manual. He completed his MSc. Wild Animal Health at the Royal Veterinary College, London in 2004 and he left CSWCT as Director of Operations in late 2007. He briefly attended to his practice, the Animal Care Centre before Born Free offered him a consultancy at the Lilongwe Wildlife Centre (LWC). Richard is now the main consultant vet for the LWC and also the MD for the LSPCA (Lilongwe Society for the Protection and Care). Any volunteer placed with Richard will gain a wealth of experience and the opportunity to work at the countries only wildlife sanctuary, which receives wild animals with all sorts of problems. The placement is also particularly interesting as you are able to participate the rehabilitation of orphans from infancy up until the eventual release. Richard lives in Lilongwe with his wife and 2 children. Dr Muller was born in Belfast, Mpumalanga in 1968. He studied and qualified at Onderstepoort University of Pretoria’s Faculty of Veterinary Science in 1993. In 1995 he married Sonika, a local lady and they have 3 daughters and 1 son. Just after qualifying, Dr Muller went to Zambia to do a game capture operation to capture and translocate Roan antelope, Sable antelope and Lichtenstein hartebeest from Zambia to South Africa. 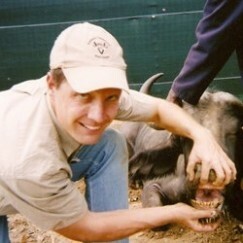 In 1994 he opened a mixed animal practice in Hoedspruit Limpopo South Africa. In 1999 Dr Muller started his own disease free African buffalo breeding project (students will be involved with this project), and he breeds disease free buffalo out of Foot and mouth disease and Corridor disease positive parent stock. In 2003 Dr Muller went exclusively into wildlife practice, operating from Hoedspruit which is in the Limpopo province of South Africa. 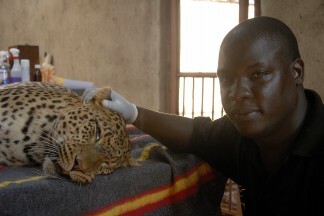 His work takes him into many Game Farms and sometimes to rehabilitation centres in the area. Students who are fortunate enough to be placed with Dr Muller work incredibly hard with long working hours but have the most rewarding and incredible experience possible. Dr Louw is married with two children and lives in Modimolle, a small town about 2 hours from Johannesburg. Dr Louw is originally from Pretoria and he studied and qualified at Onderstepoort University of Pretoria’s Faculty of Veterinary Science in 2005. After qualifying he worked in Namibia and England before coming back to South Africa. Upon his return he set up his practice at Vaalwater where he is a wildlife vet and also has his own animal clinic and he has been practising in this area for the past 5 years. His specific interest is scarce wildlife and wild sicknesses and his work takes him all over the province to local game reserves, rehabilitation centres and the Pilansburg. Students are privileged to accompany Dr Lowe in his work and experience a complete variety of wildlife with a massive amount of hands on experience under his expert guidance. He is registered in South Africa and our neighbouring country Namibia where he has a large client base and he therefore travels a great deal, often spending time away and also in more rustic conditions. Dr. Michiel van Wyk studied at the University of Pretoria / Onderstepoort and is married with one child. He started his own practice as a veterinarian in Mooinooi, a small town in the North West province of South Africa in 1994. This practice is still in use as a small animal practice, Mooinooi Animal Clinic. 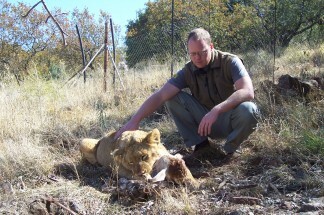 Since 1997 he started in the wildlife industry as a Specialist Chemical Capture Veterinarian. 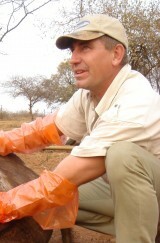 Dr Van Wyk specializes in the capturing and transporting of rhinos and he does the capturing and transporting himself. 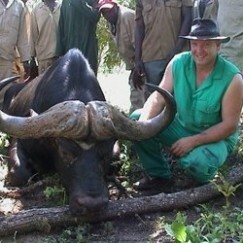 On a daily basis he works with a complete variety of animals including buffalo, lions and all kinds of antelope. Working alongside Dr Van Wyk is a once in a lifetime experience because so much happens in a day, and students experience travelling all over S Africa and maybe into Namibia and Botswana. The nature of Dr Van Wyk’s work is sleeping in sometimes basic conditions and maybe having to sleep on the road or share rooms. Dr. Bester studied and qualified at Onderstepoort University of Pretoria’s Faculty of Veterinary Science in 1991 and worked as a state veterinarian in Gazankulu for the defense force as part of national service. He married Hilna and they have one son and one daughter. He started practicing Veterinary Science in Bela Bela during 1991 in a mixed animal practice. Since the start of the practice he has been involved with the immobilization and translocation of approximately 1 500 Rhino (black & white) nationalle and internationally, and thousands of other rare and not so rare species. He has also been involved in the export of many white Rhino’s to France, China, Malaysia and other African countries. The introduction and welfare of many endagered species like Roan Antelope and Sable were and still is under his supervision. Dr. du Toit graduated with a BVSc degree from the University of Pretoria, Onderstepoort, in 2002. He is engaged to Ciske, lives in Bela Bela. Just after qualifying he worked at Atterbury Bird and Animal Hospital in Pretoria until 2003. 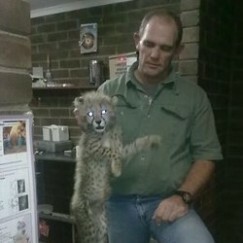 He started working at Bela Bela in 2003 where he was introduced to wildlife work. He was mentored by the two senior partners of the practice who have been doing wildlife work for many years. He is still employed at Warmbad Dierekliniek and Bosveld Wilddienste presently. He has been involved with the immobilization, treatment and translocation of many wildlife species in the last 7 years and is well versed in capture procedures, capture drug use and in seeing to the welfare of wild animals. In 2007 he had the opportunity to work in England for 6 months. He is also a member of the SAVA wildlife group and particiapte in the wildlife discussion groups on the internet. Dr. Hansen qualified as Veterinary Surgeon from Onderstepoort in 1993 with a BVSc degree. He worked in the UK for 6 months and then joined a private practice in Bela Bela. He married Petro, and they have one son and two daughters. Since 1994 he practiced in a mixed practice and for fourteen years been actively involved in Wildlife Capture and health, which involved in mass capture by darting and treatment of individual animals, captureing and export of animals to China. He do consultations to give advice on game farming, breeding and intensive breeding programmes.